SOMALILANDERS:- A former U.S. intelligence specialist has donated surveillance drones to police in Somalia, aiming to help combat a jump in deadly bombings by al Qaeda-linked Islamist insurgents. The gift comes as U.S. President Donald Trump is increasing military engagement in the region. A member of the U.S. Navy SEAL special forces was killed in Somalia earlier this month on a raid, the first U.S. combat casualty in Somalia since 1993. The Somalis received five drones, some of which have infra-red or night vision capabilities, from Brett Velicovich, whose service with the U.S. military features in a "Drone Warrior", a book to be published next month. His life story is also being developed as a movie by Paramount Pictures. "There's been a real increase in complex attacks," the 33-year-old told Reuters on a rooftop overlooking the capital of Mogadishu, as drones swooped and whirred nearby during a four-day police training course. "Some of the things that these drones will be able to do will be to conduct surveillance ... to look out for other potential Shabaab members who may be on rooftops or may be there to look at hitting the first responders." 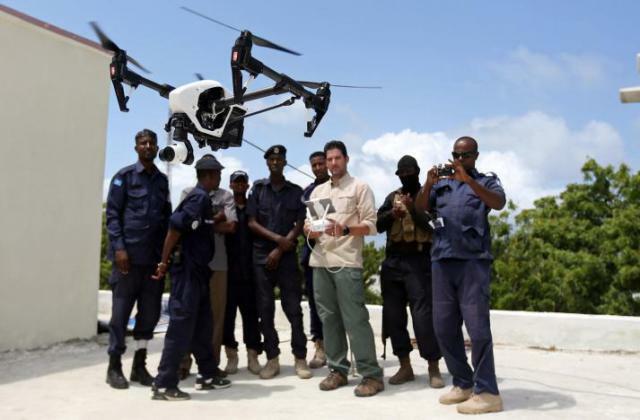 So Bancroft, a Washington-based organization contracted by the U.S. State Department to train the Somali police, brought Velicovich to Mogadishu to show officers how to use drones in examining potential threats or blast sites. "I used to work with a lot of different drones in the U.S. military and now we see the same type of technology readily available on the open market," said Velicovich, who has worked on similar programs in Iraq and Afghanistan, and is planning a program against wildlife poachers in Kenya. "The question is how can we use this (technology) to protect the people of Somalia?" The drones are made by China's DJI company and are a combination of the commercially-available Mavic and Inspire models. The biggest has a range of up to 7 km (four miles). "We shall use the drones when we are in serious operations or when the enemy attack some places or innocent people," said Somali police commissioner Abdihakin Dahir Sa'eed. One example that police cited was when gunmen ambushed officers responding to a car bomb on Mogadishu's Lido beachfront last year. Police were unable to find the last attacker, holed up in a restaurant, for several hours. A drone might have found him in minutes, Velicovich said.The gift follows a deal in London earlier this month between the Somali government and its Western allies to beef up the security forces and try to integrate regional militias. "We inherited a financial situation in which the government was unable to pay army salaries on a regular basis," he told the Saudi-owned newspaper Asharq al-Awsat. "The army needs organization, to restructure and to be supplied with arms ... I am not saying we are starting from scratch but the challenges ahead are many when compared with the possibilities."